Monster surf from northern European shortboarders. This is really heavy trad reverb, and way cool! Compressed and poundy. I'll bet these kats are as wild as the Ape Men! Pressure is a late Pyramids single track, and Moovin' is a Lee Hazelwood number first recorded by the Astronauts and Al Casey. Where do all these Dutch boys learn to pick like this? 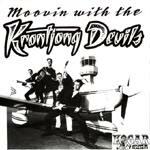 Dutch surf monsters the Krontjong Devils have a super heavy sound, over reverbed, thumpy and thick, and marginally defined on tape (not well recorded). Jan Phenomenema - guitar, El Cheazo - drums, Crazy Gerry - bass, and Daddy 007 - guitar. This ep also includes a raunchy cover of Ron Wilson's Surfer Joe, and That's Cool - That's Trash. Why the double "oo" in the name, lest the boys have a bovine fetish, or are partial to Al Casey. . It's the Lee Hazelwood rhythm dominated monster, played fast and heavily reverbed. Very chunky, and pumped with energy. This is one grodie cover of the Pyramids first post active band period. The delivery is extra crunchy and over reverbed. Faster than the original, and much thicker, this is quite a spiffy garage surf rumbler. It sports lots of fire and attitude.